Little things can be big things. You build things that seem like they are obviously going to work and then the real world intrudes and reminds you that you are not as smart as you think. You then realize that the fine points turn out to be pretty important. Figure 1: Slope an Unvented Compact Roof—This should be easy. Figure 2: Sloping Unvented Compact Roof—It is important to have and air barrier directly on the top of the structural roof deck and to have multiple layers of rigid insulation with the joints offset horizontally and vertically. It is not a good idea to only have one layer of rigid insulation due to convection. Photograph 1: World’s Largest Canadian Beer Cooler Located in Westford, MA—Barn retrofit with 8 inches of rigid foam on the exterior walls and 10 inches of rigid foam in one layer on the roof. The key thing to note is that the rigid foam on the roof is in one layer. Because it is in one layer it leads to convection. Photograph 2: Professional Embarrassment—Convective cells evident in frost melt pattern on shingles. The convection loop in this example is not catastrophic because it is not coupled to the interior space – note the air barrier sheet membrane under the rigid insulation. Had the air barrier not been present the convection cells would have been coupled to the interior and there could have been moisture transport from the interior into the roof assembly. With moisture transport from the interior the roof would have likely been doomed as it is located in a cold climate. As it is, the convection only lead to professional embarrassment and an energy penalty. It turned out that the professional embarrassment was much worse than the energy penalty. Let’s now add a bit more complexity and enjoy the outcome. Structural insulated panels (SIP’s) are a pretty elegant enclosure system – a foam core with exterior and interior linings of oriented stand board (OSB). The panels slip together to make walls and roofs – sometimes even floors and foundations. Easy, fast, no thermal bridges, it can’t get better than that. Let’s go to Juneau, Alaska and check a bunch of SIP roof assemblies (Photograph 3). The first sign that something was amiss were mushrooms growing out of the shingles – I call that the Wolfgang Puck effect (Photograph 4). Looking a little deeper (pun intended) we find moisture damage along the panel joints and the ridgeline (Photograph 5). Photograph 3: SIP Roofs—Juneau, Alaska where rainfall is measured in feet not inches. Photograph 4: Mushrooms Growing Out of Roof—The “Wolfgang Puck” effect. Photograph 5: Moisture Damage—Rot at panel joints and ridge. The pattern of damage is distinctive and can be found in many cold climate SIP roof failures. It is called “ridge rot” (Figure 3) and can easily be avoided by dealing with panel joints. 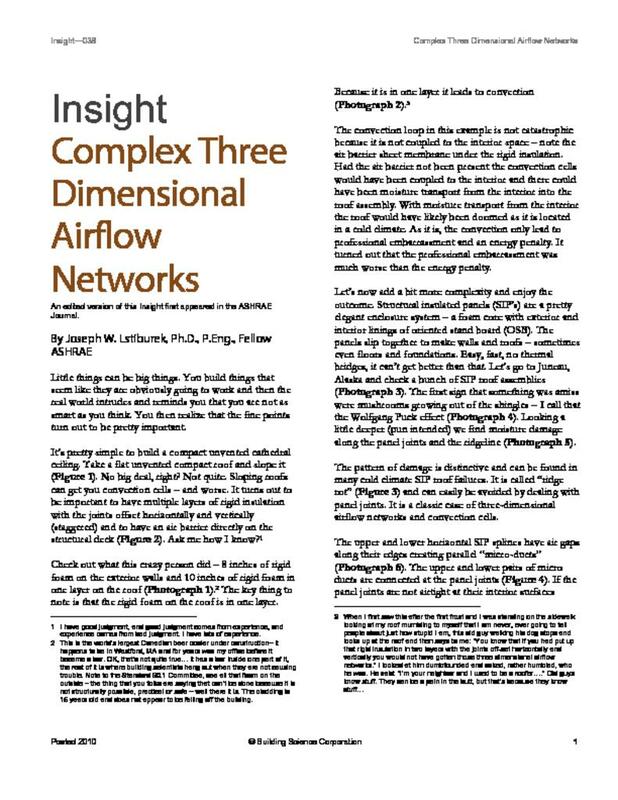 It is a classic case of three-dimensional airflow networks and convection cells. The upper and lower horizontal SIP splines have air gaps along their edges creating parallel “micro-ducts” (Photograph 6). The upper and lower pairs of micro ducts are connected at the panel joints (Figure 4). If the panel joints are not airtight at their interior surfaces interior moisture laden air can migrate into the interstitial joint cavities leading to the pattern of damage observed. Figure 3: SIP Ridge Rot—Distinctive pattern of moisture damage at roof ridge and at upper panel joint locations. Figure 4: Airflow at Joints—Upper and lower splines are discontinuous, have gaps along their edges and are connected at panel joints. Photograph 6: Micro Air Ducts—Note the air gap on each side of the SIP joint spline creating parallel micro air ducts. The upper pair of air ducts are typically connected to the lower pair of air ducts at panel joints. Note that the damage is all along the upper part of the roof – at the ridge – and at the upper portions of the panel joints near the ridge. The damage at the upper portions of the roof assembly is due to both thermal buoyancy and moisture buoyancy. The thermal buoyancy should be obvious – we sometimes refer to it as the stack effect. However, moisture buoyancy is not always obvious. Yes, moisture-laden air is less dense than dry air and tends to rise. It is one of those counter-intuitive but true things that amaze people in bars late at night. How to avoid the problem of SIP ridge rot? Make the panel joints airtight – especially over structural supports such as beams and purlins – and provide a mechanism for moisture removal such as a vented over-roof (Figure 5). Easy once you know that it is important. Well, we now know that it is important and SIP’s can rock on in cold climates. Figure 5: Avoiding SIP Roof Problems—Make the panel joints airtight especially over structural supports such as beams and purlins and provide a mechanism for moisture removal such as a vented over-roof. Let’s have some more fun and look at what is becoming an increasingly common roof assembly failure with another type of roofing panel. And the intent is not to pick on panels. Let’s go to Lexington, Kentucky. Why, Lexington? Bourbon of course, and because the example we are going to look at happens to be in Lexington. A sloping compact roof had water running out of it during cold weather in January and had water running out of it during very hot and humid weather in July. There were never any reports of rainwater leakage during or after rain. So, using Sherlockian Logic, this is clearly an air transported moisture problem in need of a building science explanation. The roof assembly is a sloping fluted metal deck (Photograph 7) constructed with vented foam panels with an OSB nail base (Photograph 8). The vented foam panels are installed directly over the top of the fluted metal deck. No air barrier is present in the roof assembly and airflow can easily be detected using an evaporative thermal biometric airflow sensing device (Photograph 9). Rust stains are obvious at the top surface of the fluted metal deck at panel joints (Photograph 10). Photograph 7: Sloping Fluted Metal Roof Deck—Condensed water from exfiltrating interior moisture laden air in the winter and infiltrating exterior moisture laden air in the summer leads to moisture damage. Photograph 8: Vented Foam Panel—The upper panel surface is OSB that acts as a nail base for shingle and other roofing systems. Photograph 9: Evaporative Thermal Biometric Airflow Sensing Device—A licked hand is very sensitive to small airflows. This building scientist is obviously having way too much fun, must be the bourbon. Photograph 10: Rust Stains—Note the evidence of moisture at the panel joints on the top surface of the fluted metal roof deck. Once again, a complex three-dimensional airflow network has rudely interrupted the successful performance of a sloping compact roof (Figure 6). The situation is made worse because the fluted metal roof deck is an “acoustical” deck with perforations. When you are going to screw up an assembly you may as well go all out. Figure 6: Complex 3D Airflow Network—Upper airflow paths are connected to lower airflow paths at panel joints. Inside is connected to outside. The solution to this problem is obvious – the roof assembly is in need of an air barrier. There is no way that the “nail-base panel” joints could have been made airtight at the bottom edges of the panel perimeters immediately on the top of the perforated fluted metal deck. Panels could have been used, but only if they had been installed over the top of an air barrier located on the top of the perforated fluted metal deck. Paperless gypsum roof sheathing supporting a fully adhered membrane air barrier should have been installed over the top of the perforated fluted metal deck. An even better solution would have been to use staggered layers of insulation over the top of the air barrier (Figure 7). Figure 7: Making the Problem Go Away—Air barrier system and staggered layers of rigid insulation. Air barriers, staggered layers of rigid insulation and sealed panel joints at interior panel perimeters are the tools in the building science toolbox that can be used to deal with complex three-dimensional airflow networks and convection. Simple, little things that turn out to be pretty big things. I have good judgment, and good judgment comes from experience, and experience comes from bad judgment. I have lots of experience. This is the world’s largest Canadian beer cooler under construction– it happens to be in Westford, MA and for years was my office before it became a bar. OK, that’s not quite true… it has a bar inside one part of it, the rest of it is where building scientists hang out when they are not causing trouble. Note to the Standard 90.1 Committee, see all that foam on the outside – the thing that you folks are saying that can’t be done because it is not structurally possible, practical or safe – well there it is. The cladding is 15 years old and does not appear to be falling off the building.